Whitland Abbey was the premier Cistercian house in Wales. It was established in 1143 and moved to its present site in 1151. It became the mother of several daughter houses in both Wales and Ireland through the 12th and 13th centuries. 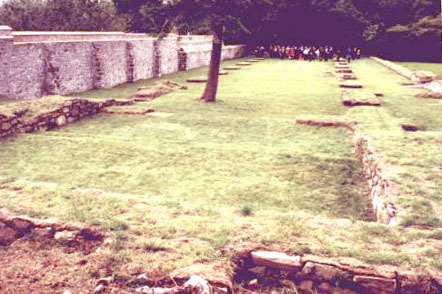 However, it is also one of Wales 'lost' sites, its above-ground remains being limited to a few stretches of walling incorporated into post-medieval garden features. Of more significance are the ponds, leats, other water features and building platforms which supplied both the abbey and the succeeding ironworks, and which survive as earthworks in the surrounding landscape. The abbey site was excavated in 1836 and again, more extensively, under Ernest Collier during the 1920s when the plan of the church was largely uncovered. A series of projects were undertaken in the 1990s under the direction of Dyfed Archaeological Trust, and culminated in the presentation of the church remains in ground-plan form. A report on the results of the work is currently being prepared for publication.